On October 3, 2015, we will be holding our second annual Knights Challenge 5K Race and 1M Walk to benefit the Hanover Township Food Pantry. This year we have changed the name in memory of our Pastor, Father Ted, who passed away suddenly last December. He was an avid supporter of the Knights of Columbus, and the charitable work we do together with the parish and surrounding community. He also was a big sports and fitness fan, so he had rallied parish support of our first 5K race. 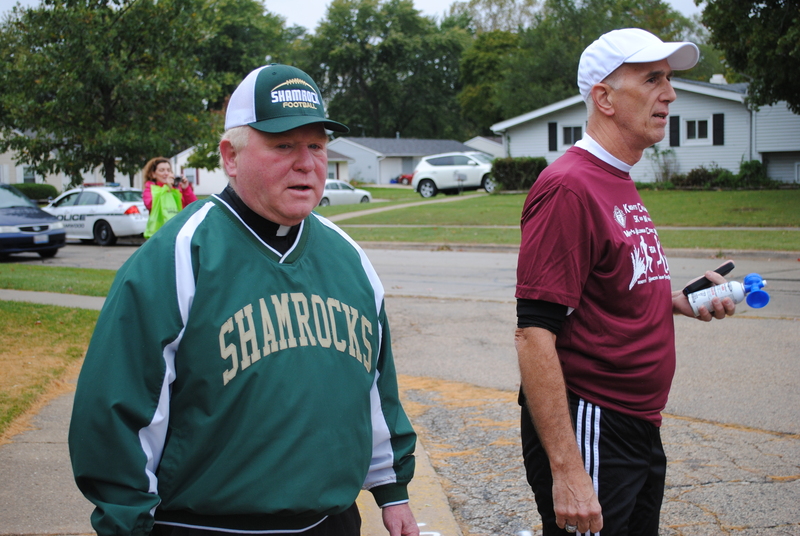 Father Ted is seen here, in his Shamrocks jersey, as he prepared to sound the starting signal for the 2014 Knights Challenge 5K race. Jim Kaltinger, Race Director, looks on as the participants line up for the start of the race. We had 75 participants, despite the 40 degree weather with snow flurries. We had set a goal of 100 participants when we began planning last year’s event. Since it was our first race, and the weather didn’t cooperate, it was gratifying to see so many people turn out to help us support this worthwhile cause. The money raised was presented to Hanover Township Food Pantry in time for the upcoming holidays. We cordially invite you to participate as a Sponsor of the 2nd Annual Knights Challenge 5K Run/1 Mile Walk. This event is sponsored by the Knights of Columbus Council #12801, in cooperation with Saint John the Evangelist Parish in Streamwood, and has been organized as a fundraiser for the Hanover Township Food Pantry. On October 3, 2015, beginning at 8:30 a.m., the 5K run and 1 mile walk will kick off at Saint John the Evangelist Parish Campus. Awards will be given to the top overall male and female finisher and to the top three male and female finishers in each five year age group. There are various levels of sponsorship for the Knights Challenge 5K Run/1 Mile Walk and placement of logos on t-shirts and website are based on sponsorship level. Download the Sponsorship Form for more details. Once again we hope to have at least 100 participants in the race this year. For those that participated last year, and provided us with contact information, we’ll send you registration materials once the online registration is open. The course will be the same as last year (you can click on the map in the right-hand margin). 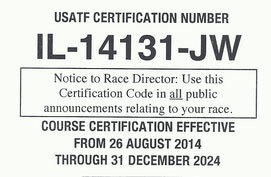 By YOUR support of our race this year, you will have the opportunity to help in this worthy cause. For that we will be forever grateful. To learn more about last year’s successful race, see our article (complete with pictures). Thank you for your consideration. Please contact us if we haven’t answered any questions you may have.